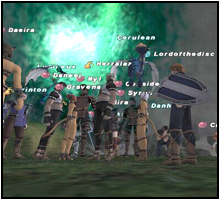 News: (Sept 20 2008) FFXI CoP section complete, Ouryu Cometh video added, BV2 Mana Burn video replaced. 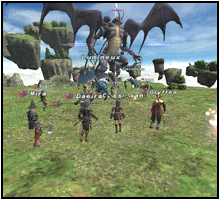 News: (Sept 12 2008) FFXI screen shots of drop items from BV2 - The Wyrmking Descends added. Wallpaper added in gallery section. News: (July 13 2008) FFVII videos replaced. CoP 2-5, 4-2 and BC's texts and videos added in FFXI section. 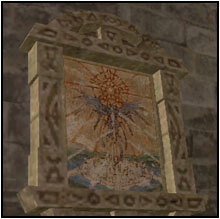 News: (May 01 2008) CoP Ancient Vows Part 1 text and video added to FFXI section. News:(April 20 2008) Long overdue update done on the site. New sections added for Final Fantasy I through VI, XI, XII, VIIAC/CC. New images added in the gallery section. New models added to merchandise section. Dead links have been removed. Final Fantasy XI is the first MMO RPG (Massive Multiplayer Online Role Playing Game) developed by Square Enix. 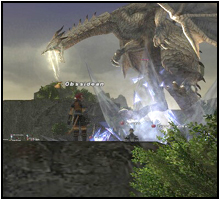 Although not a true summoned monster, Bahamut is encountered in several cutscenes and optional battles during the Chains of Promathia (CoP) storyline. WARNING: This section is extensive and contains spoilers, battle strategies and quotes from CoP. It is subdivided into sections to make information selection more practical. In the second expansion pact for Final Fantasy XI Bahamut is not a summonable monster but the King of Wyrms (a special family of dragons). 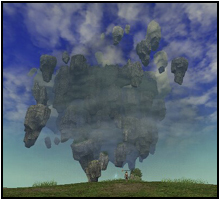 Far in the past he made a pact with a Kulu Child, that if the Keeper of the Apocalypse returned to Vana'diel he would eliminate the forms of man that inhabit the world in order to save the planet and the Mother Crystal. Tenzen, a central figure in CoP, attempts to persuade Bahamut to aid him and his companions to defeat the Keeper of the Apocalypse, and to prove that man is not a plague upon the world. However it is not until he is defeated in The Storms of Fate BC fight where he relinquishes his act of extermination. The arrival of the Keeper of the Apocalypse is near! Come forth, my minions! Let the blood of the Gods spill forth on the soil of their creation. Bahamut: How wonderful! I did not realize the Kulu still tread the soil of Vana'diel! In the decades that passed since I arose from my sleep, I have never been as happy as I am this moment. Bahamut: I, too, feel the same my Kulu companion. I will never forget the battles we fought - side by side. Over the centuries, the world has become cluttered with several new forms of man. However, if the Kulu still exist, then I can assume our pact remains intact. Bahamut: Of course. The will of evil has unlocked the door to the abyssal nightmare, unleashing the Keeper of the Apocalypse and darkness brought forth by the Keeper shall signal the end of the age of man. Bahamut: Yes, I recall the Dawn Maiden Yve'nolie giving that name to the darkness. She succeeded in locating the source of the emptiness that lives within all mortals and immortals. And then she created the terrible "Chamber of Eventide" and left it in the Celestial Capital. Prishe: The Chamber of Eventide!? Bahamut: Zilart! So it was not only the Kulu who survived! Bahamut: Foolish children! You will never break free from the Chains of Promathia! It matters not how many times you come here; the result will be the same. Even with the power of the living immortals, your people will not be saved. You have already perished. The body you inhabit is nothing more then a decaying shell. Nag'molada: What has become of Bahamut? ??? : It seems he has transported himself elsewhere. But I believe he will return to that land. It is woven into the destiny of his kind. ??? : It was thanks to you that Bahamut slipped through our fingers. Bahamut: All those who traverse the endless sea of clouds! All those who bear the shadowless sun as they cross the skies! Winged brothers and sisters, hear my call! It is I, Bahamut, King of the Wyrms! Come and gather here before me! The time has come for the fulfillment of the ancient pact! A war to protect the Mother Crystals and Vana'diel! Wyrmking Bahamut! Bahamut, conqueror of the skies! Can you hear me? It is I, Tenzen! I have traveled halfway across the world carrying the breath of Phoenix. I have heard your call! The Keeper of the Apocalypse is among us and its emptiness has already enveloped three of the Mother Crystals. I have received the blessings of the flame of resurrection. Allow Phoenix and I to accompany you in your efforts to destroy the Keeper! I am here to serve you! I pledge my life and my soul to your cause! Tenzen: The future of all Vana'diel is in danger, and you mock my sincere request!? Lord Bahamut! Are you no better then the ruler of dreams, Diabolos? Do you, too, look down upon my incompleteness!? Bahamut: Incompleteness is the least of your petty faults! Open your eyes to the destiny that lies before you - oblivion! You have found yourself quite a brave soul to bear your burdens. Not many can withstand the fury of Ouryu. Bahamut: However, the actions you have chosen to take are useless. While you are fully aware that the children of Altana are powerless against emptiness, you still drag them into your games. Tenzen: Bahamut! In size, we may seem like mere insects to you, but our strength is beyond anything you can imagine! Our roads lead to the most distant lands, our songs ring out across the seas. When united, there is nothing we cannot do. If you think of this as a game, then it is we who will bring victory to Vana'deil! Bahamut! We fight for the same cause. There is no reason for us to feud. Let us join together and put and end to the Keeper of the Apocalypse! Bahamut: Silence, child! I need not hear you whimpering! Phoenix! I ask you! What is it that you wish?! Phoenix! Sing to these children! Tell them of our age! 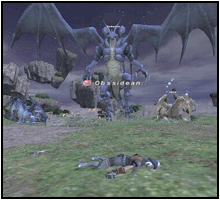 Innocent blood spills forth onto the plains of Vana'diel. The world shudders as she is thrust into chaos and despair. Neither power nor destiny can bring an end to what has already begun. However, through the storm of the night, a star of glory shines bright. Through the howling of the beasts, the song rings clear, Shining star, echoing song. You are our dreams and prayers. Ulmia: The third verse of "Memoria de la S^tona"
Bahamut: So you children also know of the "Memoria de la S^tona". As a reward for your sagacity, I shall let you in on a secret. Ages ago, when people aspired to open the Gates of Paradise, there was a child who knew the 4th verse. That child came to me, in search of my assistance. And thus we made a pact - an agreement that was to be put into motion the day the Keeper of the Apocalypse returned to Vana'diel. Bahamut: Gather, my minions! It is time for the ancient pact to be fulfilled! We shall return the light to the crystals! We shall save our mother, Vana'diel! Children of the dawn, your end is near! Available only through "The Storms of Fate" and "The Wyrm King descends"
And come with those who are unafraid of the plummet to the great depths in death. Repeatable: No, but can assist others. Quest Summary: Bahamut returned to the heavens following the defeat of the Keeper of the Apocalypse, but recently he was witnessed descending upon Cape Riverine with an army of Wyrms. Go to Bahamut and find out his intentions. Begin the quest in Ru'Lude Gardens at the NPC Esha'Ntarl. Please note, you must get all final CoP cutscenes (including the one in Lufaise Meadows) in order to activate The Storms of Fate. Afterwards zone into Riverine Site #B01 for the next cutscene. Next you must travel to the Spatial Displacement located at E-7 at the far west side of the map. To access this part of the zone, at least one person must have a Giant Scale to open the Unstable Displacement. Check the Spatial Displacement for another cutscene before preparing for the battle. The general party setup for this fight usually consists of a balanced team. Two tanks, PLD preferred, melee, debuffers, healers etc. The DRG ability "Ancient Circle" can become quite an asset in the tank party enhancing resistant to dragons. A skilled group of as low as 12 people can easily defeat Bahamut in this quest. When you begin the fight Bahamut will have all his buffs up. He will Mega Flare every 10% his health drops and typically will say some thing prior to the attack. Do not waste time trying to stun this move. If you are successful he will simply use it again once the spell wears off. Once defeated, return to Ru'Lude Gardens for the following cutscene. The only way to access the second fight with Bahamut is via this BC. One player must have a Cloud Evoker (a rare drop in many ENMs) to enter the battlefield and open it for their alliance. Ouryu is commonly mana burned, so an alliance with large numbers of BLMs is recommended. If you succeed in defeating the Wyrm, you will receive a Monarch's Orb as your reward. The second optional fight against Bahamut can be much more challenging then the first depending on your method of attack. There are 2 different ways to plan out this BC fight: melee burn and mana burn. Both methods are described. These are the most common methods used by Linkshells in FFXI. It is quite possible there are other variations in techniques and strategy. Once again you will have to travel to the Unstable Displacement located at E-7 at the far west side of the map in Riverine Site #B01. Trade the Monarch's Orb to the displacement to access the BC fight. Bahamut will be fully buffed when you enter and has a high resistance to Dispel. Every 10% of HP he loses he will do a Flare attack and will say some thing prior to it. Every 20% of HP he loses he will summon a Wyrm, either Vrtra, Tiamat, Jormungand or Ouryu. They have between 5000 and 6500 HP, and each has their own respective 2 hour abilities / pets / elementals. Ouryu will pop Earth and Water Elementals as well as worms. Vrtra will call Skeletons. All have a high resistance to the spell Sleep and high Magic resistance. Probably the most commonly used method to win, it is the least risky and a fast fight, typically only lasting 30-45 seconds once the DD's engage. The party setup generally consists of 1 tank (PLD), 1 WHM, 2-3 RDM/DRKs, 2 BRDs, 2 BLM/RDMs and the rest either RNGs/MNKs/DRKs/SAMs/WAR ect. All Melee require Sleep Potions + Opo-opo Necklace and Icarus Wings for TP gain. Once you enter the BC, melee should start to sleep TP/Meditate, the WHM should buff all parties. Reraise is recommended. Once the DD's have 100-300% TP, the tank runs in along with the mages and begins to get some hate. Mages mass dispel. BRD's Soul Voice and double buff each melee party. Afterwards everyone engages and uses their most powerful abilities/WS at once while RDM/DRKs Chainspell Stun. The success of this method depends on some luck. If Bahamut manages to use Horrible Roar between the stuns, everyone will lose most of their buffs and it will probably result in a wipe. This method of winning the BC battle requires a full alliance of skilled players with decent gear. Typically the idea is to have a small tank party, a couple melee (or none at all), bards and the rest mages. The melee knock down Bahamut's HP at a slow pace, and as he summons the other Wyrms the BLMs and RDMs kill them one by one. The biggest problem with mana burning is that there is a lot more room for error, and a couple dead players can easily result in a wipe. It is much less common to see a Linkshell use this technique.